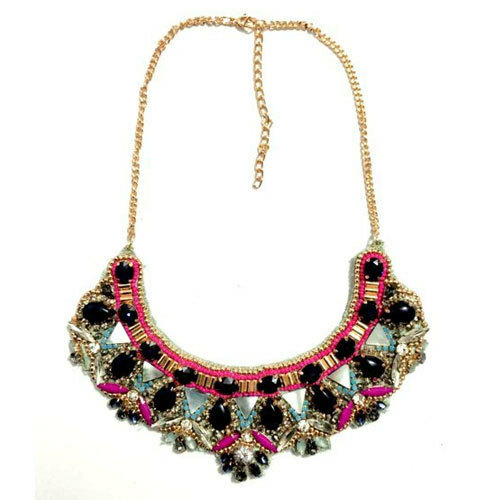 Facilitated with massive industrial proficiency and understanding in this business sector, we are engaged in offering a massive collection of Ladies Trendy Necklace. Since 2009, we, “H. M. Inc”, has been recognized as trustworthy manufacturers and exporters of fashion jewelry & handicraft items. We are specialized in producing high-quality Ethnic Bangle, Ladies Bangle, Photo Frame, Ladies Necklace, Wood Shelf, Drink Coaster, Wooden Tray and much more. All these products are designed and manufactured using optimum quality raw material that we source from authentic vendors of the market. Further, we have a team of experienced and qualified quality controllers, which keeps an eye on the entire production process. These professionals check the quality of every product and make sure that our entire range is free from all kinds of the defect and the professionals of our organization ensure that all the offered products are delivered at the customers end within the promised time period. Moreover, clients can avail our products in bulk as well as in attractive packaging as per their requirements. Our products are applauded in the market for their attributes like soft in texture and attractive designs. Owing to all the above-mentioned attributes, we have been able to gain the trust of varied patrons across the globe such as USA, Europe, Middle East and African countries.